There is a terrific TV series on at the moment called The Story of Scottish Art. It is a visual treat. Drone shots of The Ring of Brodgar emphasise grandeur. Close-ups of paintings by Ramsay and Raeburn not only reveal differences in technique, they unravel the separate principles of two great minds. The presenter, Lachlan Goudie, is instantly likeable. His enthusiasm is contagious. Overall, this is, and looks set to be, a landmark series. I have one issue with the show thus far though: the omission of the seventeenth century. The first episode tackled a vast period: the Neolithic to the Reformation. We gazed deep into carved markings left by the enigmatic Picts; we admired the sophistication of the Gaels; and we witnessed the glamour and flair of early Stewart Kings. It was fast, but it was cohesive and entertaining. The show concluded with a vigorous account of The Reformation. Likening the actions of Scotland’s sixteenth-century reformists to the current actions of ISIS at Palmyra was a brave yet enlightened comparison to make. After the first episode, I was excited to learn what would be said about the seventeenth century in episode 2. In the past, seventeenth-century Scottish art has been largely ignored because it was believed that iconoclasm had killed creative endeavours. Furthermore, Scottish art, like the philosophy which drove it, was so phenomenal in the eighteenth century that the seventeenth century has been forever cast in shadow by light emanating from Scotland’s Golden Age. Episode 2 began with Lachlan reliving The Grand Tour experience of all aspiring artists living in eighteenth-century Britain. The seventeenth century was ignored, as usual. It is time that Scotland knew the truth about art made during the era immediately preceding the Union with England. This period was not a cultural dark age – it was a time when the people of this country took control of their visual culture and used it to question and defy authority. For example, consider one of the first paintings you meet at the Scottish National Portrait Gallery: George Jamesone’s Anne Countess of Rothes and her Two Daughters (see below). In this, Anne looks out to the viewer with determined spirit. Her stare is trying to convey something. Notice how odd the pictures behind her appear. These pictures aren’t arranged like this because Jamesone could not cope with overlapping. These pictures help to tell Anne’s story. Another clue which reveals that this portrait holds a message is the cherries held by the girls. The cherries aren’t there because they look attractive. Cherries are seventeenth-century symbols of fertility. At the time this work was painted, Anne’s husband, the Earl of Rothes, was in London asking the King to repeal new land laws which would see the family lose a vast amount of their estate. With this portrait, Anne was telling visitors to the Rothes home that the family was stronger than ever and that her Mars, the Earl of Rothes, would return to add more cherries to the Rothes line. The picture tells doubters that the family is here to stay and that they don’t take orders from anyone – not even the King. It is a clever picture. 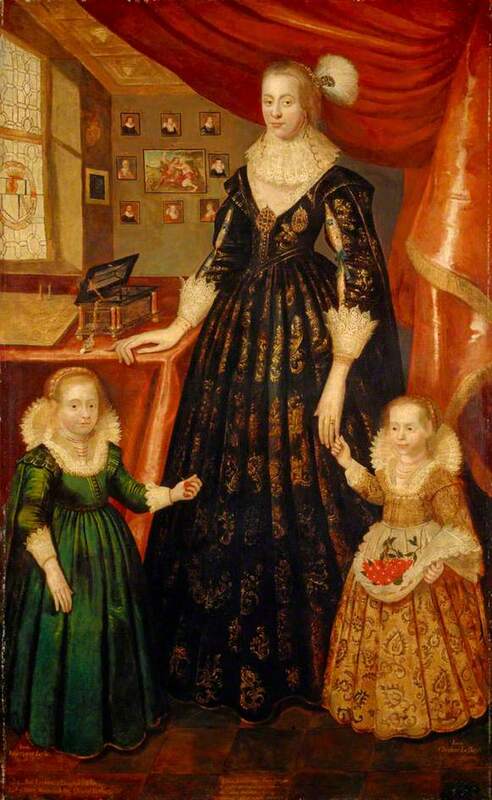 Jamesone’s Anne Countess of Rothes and her Two Daughters is just one of several symbolic seventeenth-century Scottish portraits. These portraits, due to the sustained popularity of eighteenth-century portraiture, are usually hidden away in gallery stores or in private collections. This is why the story of seventeenth-century visual culture remains untold. The work is not accessible to the public (though initiatives such as Your Paintings are thankfully changing this). Commissions for painted interiors also rose dramatically in seventeenth-century Scotland. With art removed from sacred space, aspirational and newly affluent town-dwelling Scots brought colour into their lives by decorating their homes with bold continentally-inspired designs. The imagery of these painted interiors was usually highly symbolic. With devotional images removed from life, brave seventeenth-century patrons created a Protestant-friendly language of symbols derived from prints and emblem books. For example, corn husks and grapes did not simply appear on the ceilings of properties like Gladstone’s Land because they were attractive – they were chosen because they symbolise Eucharist. When seventeenth-century Scots looked up at symbols like these in their homes, they were actively praising God for the gift of property; they were thanking him for fruit in return for labours. These painted interiors were not the product of a sterile and fearful society. These interiors were sophisticated and they were commissioned by people who did not take kindly to being told that they could no longer worship images. What remains of seventeenth-century Scottish art indicates that a large number of Scots were critical of rules enforced upon them by reformers and the monarchy. Furthermore, deeper analysis of the art and material culture made during this period reveals that many seventeenth-century Scots felt, profoundly, that their voices mattered. The Scots who instigated, contributed to and championed post-iconoclastic art were creative, intelligent and revolutionary. Many artists living in post-referendum Scotland in 2015 would be absolutely inspired by what these people had to say, and how they went about saying it, in their art. It is time, therefore, that the seventeenth century was included in the story of Scottish art. Scotland produced intelligent and thought-provoking art between the Reformation and the Act of Union. This is a fact which needs to be acknowledged and accepted – not hidden. Tags: Act of Union, Anne Countess of Rothes, George Jamesone, Reformation, Scottish Art. Bookmark the permalink. Read my first blog post for The George Washington Wilson Centre for Visual Culture, University of Aberdeen. I discuss seventeenth-century Scottish art and its omission from historiography. Pertinent and relevant and enjoyable thanks! Very interesting article, especially the part about how the past could inform the present. I know Scotland is a very intellectually active and politically engaged part of the world to be in these days. 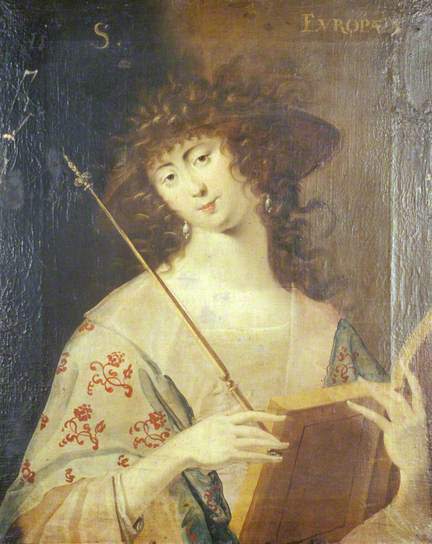 I do wonder about Anne Countess of Rothes, though. Under that huge dress she was wearing was she by any chance standing on a pair of stilts? The last episode was fantastic. It adds a deep sense of heritage and philosophy to being a contemporary Scottish writer. So did the Rothes survive, or they one more high family that dropped into history’s dust bin?